Awards season is my favourite time of the year, not only because it falls around my birthday but as a woman obsessed with dresses I love seeing the red carpets. The Oscars were no exception. While I had to work and miss the festivities and take part in the Oscars drinking game I did get to drool over the gowns the following morning. Kate Mara is adorable and there’s just something about blush light fabrics I’m loving this season. My favourite looks are ones that look effortless and her messy bun and the simplicity of the garment just make sense. While you can argue she should have worn jewelry I think the detail in the dress is more than enough. Jessica Chastain is not only proving her acting chops but also that she can handle herself on the red carpet. This dress is pretty bold compared to what we usually see with it’s bright gold and harsh black, but it just works. The dress is an art piece and keeping her hair back was the right choice. A dress like this can’t be pulled off by many but her soft pale complexion and naturally striking features just compliment it all. 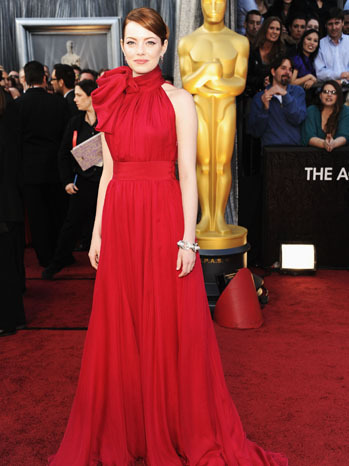 Funny girl Ellie Kemper was a show stopper in this dress. I’m really at a loss for words, she and I have very similar colouring and I want this dress. I would put up with the uncomfortably high heels, four hour ceremony, starving to eat, possibly restlessness of being stuck in a chair for that long to wear this dress. She looks like a movie star. The colours are very fall based but you cannot deny how glamorous she looks. Her bold bangs and earring are drawing just enough attention to her face while the dress is jewelry itself. Wowza girl. Wowza. In my world Emma Stone needs no introduction. While I didn’t get to see the Oscars I did get to see her present an award; the girl crush continues. This girl knows her stuff. I don’t think I’ve ever seen an outfit on her I didn’t like. She could pull off a paper bag (How cute would she be as the Paper Bag Princess?). This dress is striking and simple. While I love her in blues and blush colours she can rock the colour red like it’s nobody’s business. The cut is perfect giving her legs that go for miles. It’s dramatic with the pretty large bow by her face but it was the perfect dress for this new It Girl to step out in the awards world. She never looks overdone and this looks like she just pulled it out of her closet, nodded and slipped it on. She’s that nice girl in high school who was perfect and as much as you wanted to hate her for it, you couldn’t really because she’s that cool. Kristen Wiig disappointed me when she added a choker to her SAG Awards dress which to me, threw the whole look out the window, but Ms. Wiig has redeemed herself with this number. Favourite look of the night by far. I adore light colours even though they wash out my pale complexion. Kristen Wiig has the perfect glow to complement the subtle colour in the dress and I’m a huge sucker for mixing girly and rocker style trends. Her nails kind of made it for me, she looks so sweet and innocent and the darkness on her fingertips just literally give it the ultimate finishing touch. Good work Ms. Wiig, looking forward to seeing more of you on the red carpet.